German writer and communal leader; born at Königsberg Dec. 6, 1750; died Dec. 25, 1834, at Berlin, where he had settled in 1771. As the son-in-law of the rich banker Daniel Itzig, and the friend and pupil, and subsequentlythe successor, intellectually, of Moses Mendelssohn, he occupied a prominent position in both Jewish and non-Jewish circles of Berlin. His endeavors in behalf of the Jews and Judaism included the emancipation of the Jews of Berlin and the various reforms connected therewith. Frederick William II., on his accession, called a committee whose duty was to acquaint him with the grievances of the Jews, Friedländer and Itzig being chosen as general delegates. But the results of the conference were such that the Jews declared themselves unable to accept the reforms proposed, and not until after the French Revolution did the Jews then living on Prussian territory succeed in obtaining equal rights from Frederick William III. (edict of March 11, 1812). Friedländer and his friends in the community of Berlin now turned their attention to the reform of worship in harmony with modern ideas and the changed social position of the Jews. 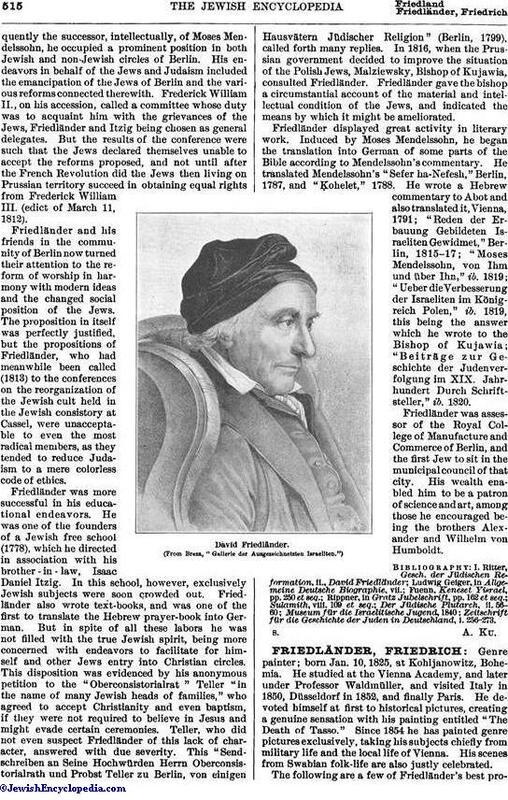 The proposition in itself was perfectly justified, but the propositions of Friedländer, who had meanwhile been called (1813) to the conferences on the reorganization of the Jewish cult held in the Jewish consistory at Cassel, were unacceptable to even the most radical members, as they tended to reduce Judaism to a mere colorless code of ethics. Friedländer was more successful in his educational endeavors. He was one of the founders of a Jewish free school (1778), which he directed in association with his brother-in-law, Isaac Daniel Itzig. In this school, however, exclusively Jewish subjects were soon crowded out. 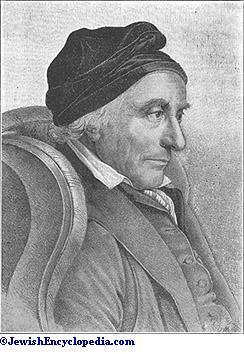 Friedländer also wrote text-books, and was one of the first to translate the Hebrew prayer-book into German. But in spite of all these labors he was not filled with the true Jewish spirit, being more concerned with endeavors to facilitate for himself and other Jews entry into Christian circles. This disposition was evidenced by his anonymous petition to the "Oberconsistorialrat" Teller "in the name of many Jewish heads of families," who agreed to accept Christianity and even baptism, if they were not required to believe in Jesus and might evade certain ceremonies. Teller, who did not even suspect Friedländer of this lack of character, answered with due severity. This "Sendschreiben an Seine Hochwürden Herrn Oberconsistorialrath und Probst Teller zu Berlin, von einigen Hausvätern Jüdischer Religion" (Berlin, 1799), called forth many replies. In 1816, when the Prussian government decided to improve the situation of the Polish Jews, Malziewsky, Bishop of Kujawia, consulted Friedländer. Friedländer gave the bishop a circumstantial account of the material and intellectual condition of the Jews, and indicated the means by which it might be ameliorated. Friedländer displayed great activity in literary work. Induced by Moses Mendelssohn, he began the translation into German of some parts of the Bible according to Mendelssohn's commentary. He translated Mendelssohn's "Sefer ha-Nefesh," Berlin, 1787, and "Ḳohelet," 1788. He wrote a Hebrew commentary to Abot and also translated it, Vienna, 1791; "Reden der Erbauung Gebildeten Israeliten Gewidmet," Berlin, 1815-17; "Moses Mendelssohn, von Ihm und über Ihn," ib. 1819; "Ueber die Verbesserung der Israeliten im Königreich Polen," ib. 1819, this being the answer which he wrote to the Bishop of Kujawia; "Beiträge zur Geschichte der Judenverfolgung im XIX. Jahrhundert Durch Schriftsteller," ib. 1820. 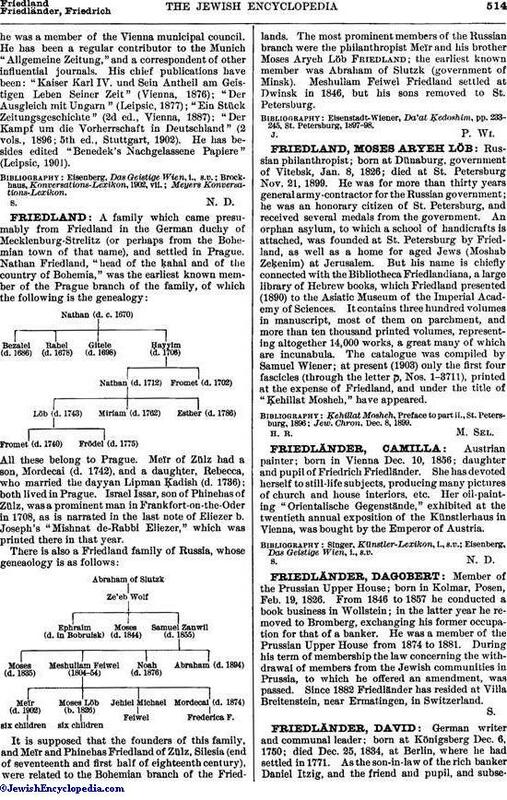 Friedländer was assessor of the Royal College of Manufacture and Commerce of Berlin, and the first Jew to sit in the municipal council of that city. His wealth enabled him to be a patron of science and art, among those he encouraged being the brothers Alexander and Wilhelm von Humboldt. (From Breza, "Gallerie der Ausgezeicnetsten Israeliten." Zeitschrift für die Geschichte der Juden in Deutschland, i. 256-273.